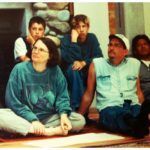 The Power of Hope was founded in 1996 by Charlie Murphy and Peggy Taylor out of the belief that young people — regardless of their circumstances — are an untapped resource for community renewal and social change. We are living in a time of rapid change in which young people are exposed to levels of personal and societal stress unknown even a generation ago. The challenges many youth face in school, at home, and in peer groups cause undue stress at a time when they are developing their values and aspirations and preparing to set off into adult life. Power of Hope Camp provides a community of support, empowerment, and inspiration for young people during this pivotal time in their lives. When we acknowledge the creative potential of youth, rather than treat them as “problems to be solved,” remarkable transformations occur. Youth struggling with hopelessness, anger, and self-destruction transform into hopeful, empowered leaders. Youth who are already self-confident recognize their ability to serve as allies and collaborative change-makers in society. There is a place for youth from all walks of life at Power of Hope. Read more about what teens have said after attending Power of Hope Camp. If you have any questions about the Power of Hope Camp and how we may serve you or a young person you care about, please do not hesitate to contact us.